When Margaret Anne Craig says that in business she’s learning on the job, take a moment to reflect that until recently this remarkable company Chief Executive was less sharp suit and more lab coat. 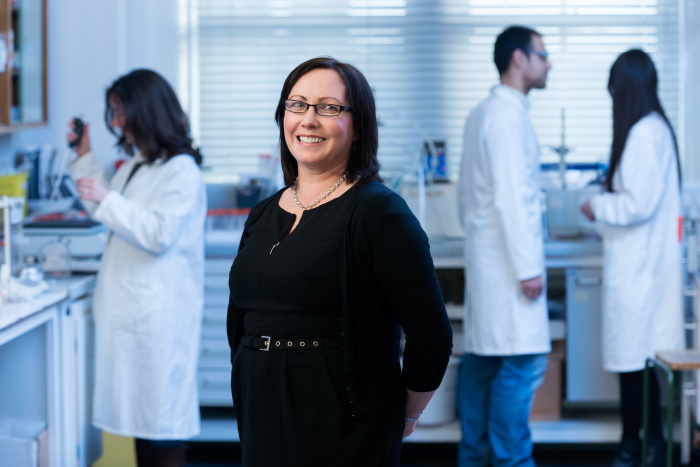 Because before setting up Clyde Biosciences in 2012, a major player in the life sciences sector, this awe-inspiring businesswoman was spending her normal 9-5 as an academic scientist. Only two short years later and Margaret Anne is leading a Glasgow-based business working at the very cutting edge of drug discovery research. A business with the potential to attract millions of pounds worth of investment, and already receiving global recognition for its pioneering work. But Mac, as she’s affectionately known by her team, would be the first to admit that making the transition from academic research to business leadership in such a short space of time has taken her way, way beyond her comfort zone. However, despite the numerous challenges of learning the language of enterprise from a standing start, Margaret Anne sets a breathtaking entrepreneurial example. The road from laboratory to boardroom began back in 2010 when Glasgow University asked Margaret Anne to look into the commercial potential of setting up a company to develop state of the art technologies and research into the effects of drug use on human tissue. Given that the development of any new drug takes 10-12 years, at least one billion pounds, and can often result in toxicity to the human heart, developmental technologies in this field have massive commercial potential. And it was into this potential that Margaret Anne plunged herself. A one year fellowship to conduct commercial viability research meant that Mac’s regular routine was rapidly replaced with an intensive education in enterprise. Although it was a thrilling experience, and one which she threw herself into heart and soul, at that stage Margaret Anne had no notion to enter enterprise herself. But as the business plan began to unfold, it dawned on her that she simply had to take the lead. Who else would understand all the ins and out, be able to plan the pipeline, have the passion, or see the big picture? It was after she blew away the opposition to scoop the Royal Academy of Engineering’s £40K ERA Foundation Entrepreneurship Award in 2011, that Margaret Anne Craig went on to lead Clyde Biosciences from the front, and take the sector by storm. She jokes that her transformation from lab coat to power suit happened almost overnight – from academic to Alanna Sugar in the blink of an eye. She’s gone from wearing that lab coat to being dressed by Liberty; she’s met the Queen, politicians and business leaders; she’s been to a G8 summit, and travelled to Brazil, Japan, the USA, and Europe. And now she’s at the brink of taking Clyde Biosciences into multi-million pound investment deals. But she still takes time to thank her husband and two daughters for their stupendous support, and makes special mention of her mentor Paul Strzelecki and Scottish Enterprise for their help on this rollercoaster ride. It gives Margaret Anne particular pleasure to head up a world- leading business right here in central Scotland. She’s so pleased to put something back into the Scottish economy, and she’s proud as punch of her team and their ground-breaking work. And with Margaret Anne Craig at the helm of Clyde Biosciences, you just know the future of our health is in great hands.